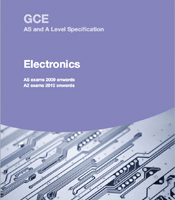 We are not developing a new A-level Electronics qualification due to government changes to A-levels. As an alternative, you may like to consider our new AS and A-level in Physics, which is accredited for first teaching in September 2015. A-level Electronics is an absorbing course for students who want to explore and understand the electronic systems that underpin everyday life. There are six units in the specification – three at AS Level and three at A2. Four of the units are assessed by written exam. Two units are coursework focusing on AS units 1 and 2 in the first year and A2 units 4 and 5 in the second year. A-level Electronics has strong elements of Mathematics, Physics and Computing within it. Students who have studied these subjects in the new GCSE, as well as GCSE Electronics, will be well-prepared to study for the A-level. Exams for this specification are only available in June.